Two months after brush cutting, shredding and thinning of woodland near a new home. 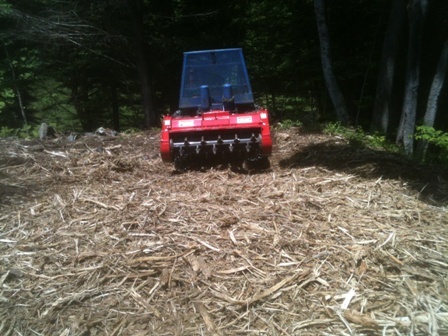 Newly seeded grass is just sprouting up through the shredded mulch left behind by Forest Savers' machine. Brush shredding and woodland thinning has created an attractive approach to this new home. In regions prone to wildfire, this shredding and thinning creates a defensible space that is less likely to support a forest fire. Thinned and mulched woodland along a driveway to a home. A portion of unthinned and unmulched woods. One year after thinning and shredding in these woods above a pond, a carpet of ferns covers the forest floor. Before thinning and shredding, the woods above the pond looked like this. Opposite sides of a driveway. On the left an abused woodland has had the poorest trees removed and the underbrush has been cut and shredded. On the opposite side of the driveway, on the right, you can see what the woodland was like before sanitation thinning and brush cutting. 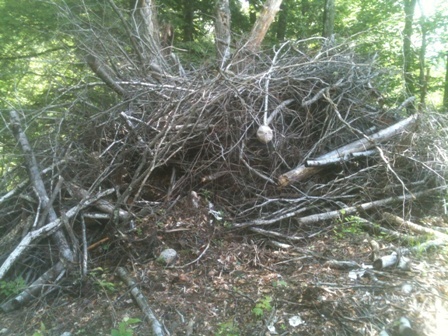 Brush pile before and after shredding. See the hat hanging in the middle of the brush pile as a size reference.